My Norwegian friend Eidar just wrote to inform me that their company (Netlife Research) has finally released Bad Usability Calendar 2008. 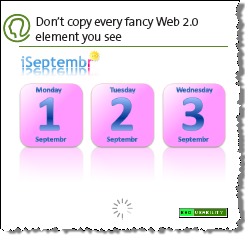 Last year, the calendar got quite popular and even Jakob Nielsen mentioned it in one of his newsletters. This year, I’m more than ever looking forward to use it. The calendar has — as always — 12 brilliant examples of how not to build a calendar. What’s even better, the calendar now has it’s own dedicated website: www.badusability.com, where it’s also possible to upload photos of the calendar in the wild. Like last year, I’ll ask Thomas Baekdal to work with me on a Danish version… unless somebody else puts it up before us (if you plan to translate it, drop me a note so I don’t waste the time). This entry was posted by Jesper Rønn-Jensen	on Thursday, January 17th, 2008 at 19:19 (GMT-1)	and is filed under Humor, Usability. You can follow any responses to this entry through the RSS 2.0 feed. Both comments and pings are currently closed.